Guests can enjoy a complimentary breakfast. Public areas are equipped with wireless Internet access (surcharge). 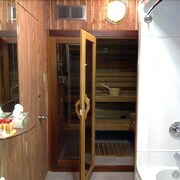 This Boischatel motel also offers a fitness center, tour/ticket assistance, and multilingual staff. Complimentary self parking is available on site. Econo Lodge Montmorency Falls has designated areas for smoking. Situated on a river, this motel is 1.8 mi (2.9 km) from Royal Quebec Golf Club and 2.2 mi (3.6 km) from Montmorency Falls. Parc de la Chute-Montmorency is 2.5 mi (4.1 km) away. A fitness center, WiFi in public areas, and coffee/tea in a common area are available at this motel. Free continental breakfast and free self parking are also provided. Additionally, free newspapers, tour/ticket assistance, and multilingual staff are onsite. All 32 rooms provide conveniences like refrigerators and microwaves, plus WiFi and TVs with cable channels. Other amenities available to guests include coffee makers, free weekday newspapers, and free local calls. 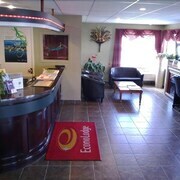 Econo Lodge Montmorency Falls offers 32 air-conditioned accommodations with coffee/tea makers and complimentary weekday newspapers. Guests can make use of the in-room refrigerators and microwaves. This Boischatel motel provides wireless Internet access for a surcharge. Cable television is provided.